Petflation October Update – Truly Mixed Signals! 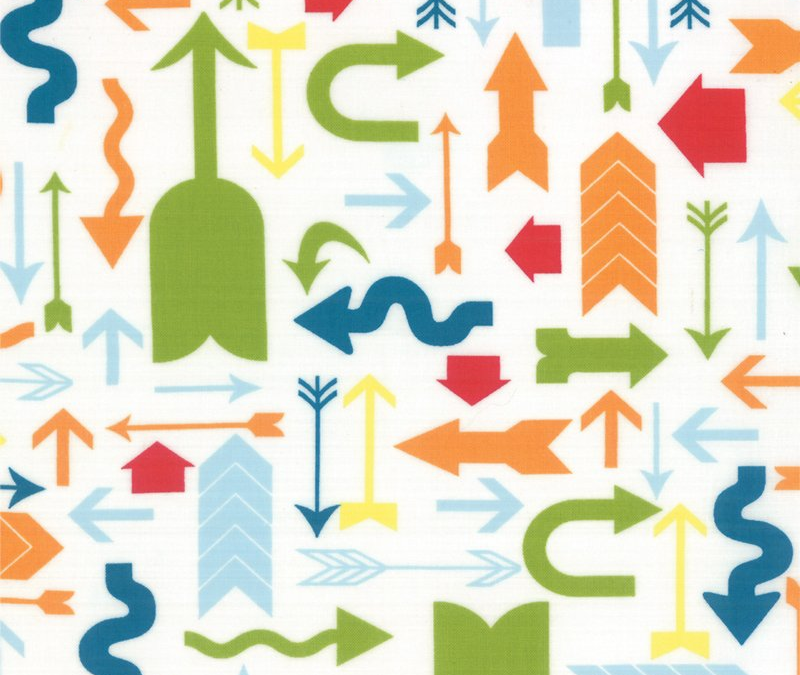 The CPI data for October is out – with truly “mixed signals” – up, down and sideways. The total pet market prices didn’t change much +0.14% over September. Pet Supplies were up, but the increase was slightly lower than 2013. 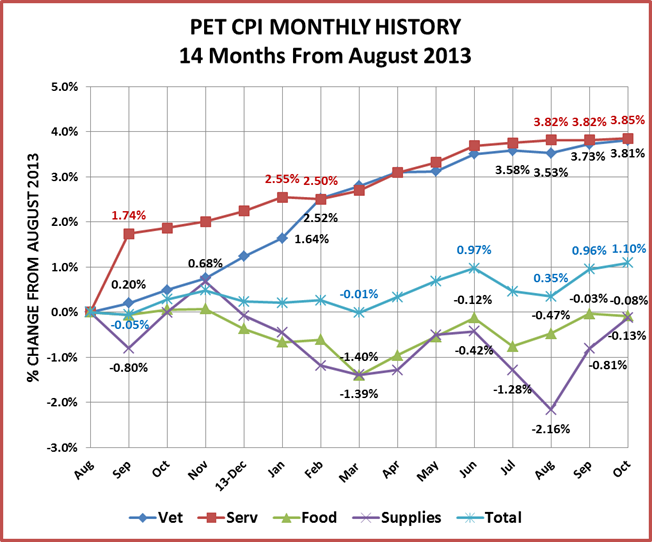 However, the Pet Food CPI dropped, which is unusual for October. Service prices were both almost “flat” – up less than 0.1%, very low for the Fall. Since the October Total Pet CPI surpassed June prices, the previous high point, we’re back on track for November to once again be the priciest month for the consumer to buy pet supplies and services. 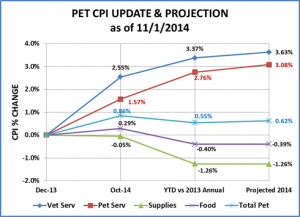 Another large price increase in the Pet Supplies Segment – up 2.1% in 2 months. Huge. Prices continue almost flat in Service segments. 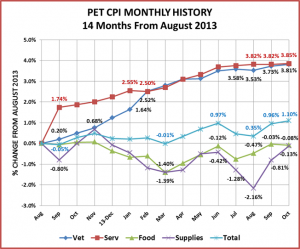 Vet Service CPI – up 0.08% over September – Increases “flattening” out. Pet Services – up 0.03% over September – Continuing essentially flat. Unusual. Pet Supplies – Up 0.69% over September– Normal jump for October. Total Pet – Up -0.14% from September – Back on track…barely. Once again there is little change from last month’s overall Total Pet projection…up 0.62% for the year versus up 0.60% for the year. However, Food prices dropped, which is very unusual for October. Service prices were almost flat. In fact the only normally performing segment was Supplies which had a reasonable increase. It has been a while since we have described Supplies as performing “normally”. I think the monthly pattern helps us all to get a better understanding of what is happening in the market and what may occur during the balance of the year. I added the October numbers to the graph that I produced last month. Here’s what the last 14 months of CPI’s look like. Hopefully, the graph makes it easier for you to see both the similarities and the differences between segments and how they blend together to produce the overall industry total. Pet Services – The biggest price increases in this segment tend to come in Spring and Summer and slow down in the Fall and Winter months.This segment is performing according to the expected pattern. However, the Fall increases are considerably lower than normal. We can expect slight price increases in November and December. Services Total – Overall the prices have been basically flat since June. There will still be a 3+% increase in prices for the year but it was almost all generated in the first half of the year. These segments have had almost an identical pricing performance “footprint” since February of 2014. Without the increases in Vet & Non-vet Services, Total Pet Prices would be down for the year! Pet Food – As you know, Food is the largest segment and is the biggest “driver” for the Total Pet Market. Food and Treats have become even more intensely competitive, driving prices down and resulting in somewhat erratic behavior in terms of pricing. The pricing in this segment still has a roller coaster pattern but it has been all downhill as prices this year have consistently remained below 2013. Also in recent years prices rise through November, then drop sharply in December. August and September had “normal” increases but October produced a rare price drop. We should expect some sort of increase in November followed by a December drop. The question is how big of a drop? It does seem to be a pretty good bet that overall Food prices will be down for the year – for only the second time in history. Pet Supplies – Prices went up 0.69% which is just slightly less than last year (+0.8%). However, with last month’s 1.38% increase, it means that prices are up 2.1% over 2 months. The last time that happened was Jan-Mar 2009. As you recall, Supply prices hit their all time peak in 2009 and have been deflating ever since. With the October increase, prices are only 0.1% below what they were in October of 2013…and equal to June of 2008. What about November and December? Prices should continue up in November but how much? This has been a steep rise in prices. Let’s put it in perspective. If we have a 0.0% increase in November, this 3 month price increase “run” would still be the 6th largest in history. While we are unlikely to overtake the #1 spot , a 3.2% increase from June to September of 2007 (before the recession), it still is concerning. And how steep will December’s drop be? The recent increase has certainly mitigated the deflation in supplies…now expected to be less than 1.3% for the year. However, it has also reinforced the “volatility” of this segment. 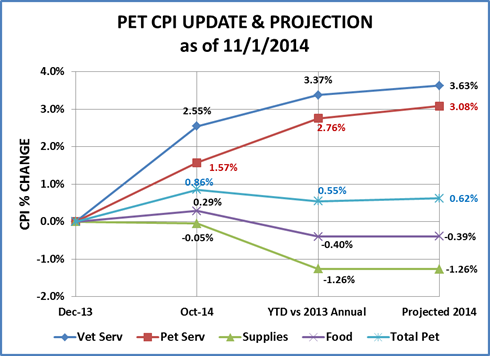 Pet Food & Supplies – These segments are only about 0.1% below where they were in October 2013. However, they have basically been “below the surface” in the interim months. Both should rise in November and drop in December. The question is how much? Total Pet – As we said earlier, without the price increases in the service segments, prices in the Total Pet market would be down for the first time ever. As it is, we are on track to compete for the lowest increase of all time – 0.6% in 2010. This may be a very real possibility. If Service prices continue their current pattern of minimal increases and Food and Supplies prices have their normal December price drop, then 2014 could beat 2010. The pricing in the Total Pet Market is being driven consistently up by the Services but gets its rollercoaster pattern from Food & Supplies. While service price increases have been happening for a long time, this rollercoaster pattern in Food & Supplies just started in 2009. In the years prior to 2008 these segments were less erratic and prices grew at a relatively slow and steady rate. Prices on Food actually went up in December in all but 1 year (1998) prior to 2009. In 2008 prices started sharply upward. The biggest price increases in history occurred in 2008 & 2009 – during the teeth of the recession. Then in September of 2009 the bottom dropped out of food and supply prices and we have been on a rollercoaster ride ever since. It would be nice to get back to “normal” but all the major business publications say that the recession changed the U.S. consumer forever…with value (price+quality) becoming the overwhelming factor in purchase decisions. It seems that this new “normal” is contributing to the erratic CPI in the segments in our industry.